I got a package on the mail today. When I saw it I couldn’t stop smiling. When I opened it, the object of my affection slowly crept out of the package and looked at me. It was the book ‘Bottom’s Dream‘ by Arno Schmidt. I discovered ‘Bottom’s Dream‘ through an article I discovered through Twitter. The article said that the book was thick, it was originally written in German, this was the first time it was getting translated into English, it was translated by the old German hand John E. Woods, and the book had influences of Joyce and Poe. I have a soft corner for chunksters and everything about the book gently whispered to me to get it and I ordered it eventhough it cost me a small fortune. I was thrilled when it arrived today. Dalkey Archive Press, the publishers, say that only 2000 copies of the book have been printed. I am thrilled to be one of the lucky 2000 to have a copy! Yay! The first thing that hits you when you look at ‘Bottom’s Dream‘ is its size. There is an article by Scott Esposito which describes the book as a ‘chunkster‘, ‘enormous‘, ‘giant‘. Its dimensions are given as 11×14 inches with 1500 pages. Tolstoy’s ‘War and Peace‘ is that long and so we expect something of that size. But ‘Bottom’s Dream‘ defies all expectations. ‘Chunkster‘ doesn’t begin to describe it. It is HUGE! Comparing it to other novels in terms of size is meaningless. I have seen some huge books during my time, but none like this one. I have around two thousand books in my collection and this is the biggest of them all. I take out ‘War and Peace‘, ‘Les Miserables‘, ‘The Count of Monte Cristo‘ and put them next to it and ‘Bottom’s Dream‘ towers over them all. It towers over even the huge one volume edition of Arnold Toynbee’s ‘A Study of History‘. To give you an idea, if I take a knife and cut it in the middle into two, each of the resulting two books are as big as ‘War and Peace‘ in terms of dimensions and thickness. It is not a ‘chunkster‘ or a giant. The best way to describe it is this. There is a scene in the TV show ‘Game of Thrones‘, in which Daenerys’ dragon flies and descends and lands next to her. The dragon is huge and Daenerys is tiny next to it. ‘Bottom’s Dream‘ is that dragon – it is a book dragon. It dwarfs every other book in sight. Here is a picture of the book. I have put it on top of today’s newspaper, so that you can see the relative size. I took the book out of its slipcase and opened it. It was so heavy that I couldn’t hold it in my hand for long. I put it on my lap. It weighs a little more than six kilograms (thirteen pounds) and I could feel every ounce of it. This is definitely not a book you read when you commute by the subway. It is too big to carry. It is not even a restaurant book, because of its size. This is a book that you can only read in the library or at home after putting it on the table. After opening the book, I flipped through the first few pages. Every page had three columns – the main text ran through the middle column, while the left and right columns had notes and comments. The prose was hard to read – it looked like a combination of surrealistic Joycean prose and Burgess’ nadsat. I looked at the last pages of the book and read the afterword by the translator, James E. Woods. Woods describes how he got into translating the book and shares his thoughts on it. It is brief and to-the-point. It is just two pages long. I smiled when I read that, because a 1500-page book might have benefited by a longer afterword. Or maybe a fifty page introduction. But the publisher and the translator had decided not to have any unnecessary words – Arno Schmidt is what you want, Arno Schmidt is what you will get. Thanks to James E. Woods for taking twelve years of his life to translate this book. Translating epic length books is a labour of love and one can’t pursue it unless one loves the book in question very deeply. There is not much money to be made here. Thanks to Dalkey Archive Press for publishing this work. 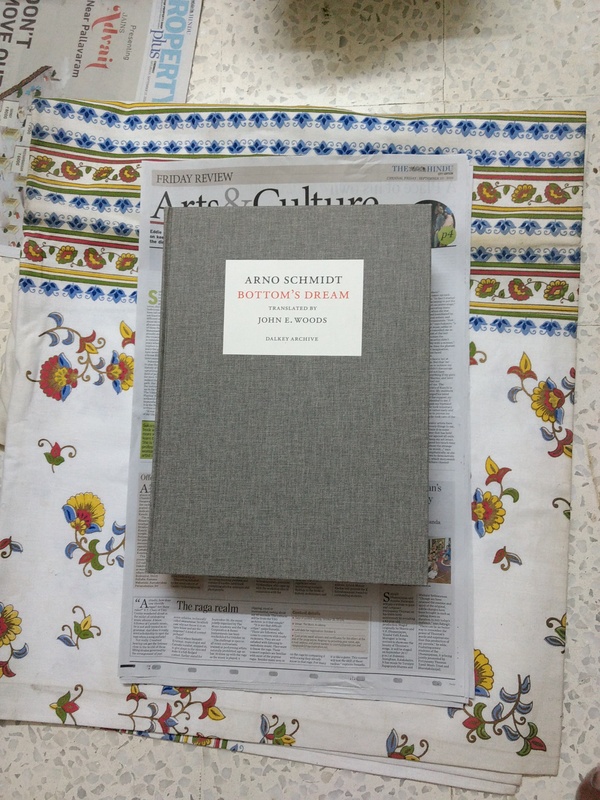 Bottom’s Dream, Arno Schmidt, thanks for coming to live in my home. I hope you like it here. I am normally bad at taking care of my books, but I will keep you wrapped in plastic sheets, keep you in a dust-free environment and take care of you well. And hopefully, I will read you one day soon. German Literature Month is around the corner and so that day is not as far as you think. ‘Bottom’s Dream‘ has been sighted in a few other places. Here is an article about it. Here is an article comparing ‘Bottom’s Dream‘ to other big chunksters which can’t be read in the subway. 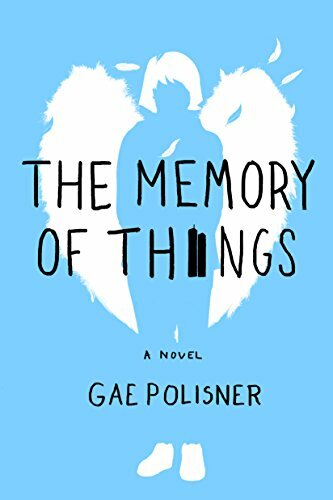 One of the books that I eagerly awaited this year was Gae Polisner’s ‘The Memory of Things’. I loved Gae Polisner’s first two books ‘The Pull of Gravity‘ and ‘The Summer of Letting Go‘ and so couldn’t wait to read the new book. It came out this week and that is what I have been reading for the past few days. Here is what I think. ‘The Memory of Things‘ is set on the day of 9/11 and the story continues during the subsequent days of that fateful week. It is a beautiful Tuesday morning and suddenly there is an explosion and initially people ignore it but when more explosions happen and everyone realizes what is happening, people start moving out of buildings. The narrator of our story, Kyle, is a teenager who is presently at school. Once the seriousness of the events become apparent, everyone from Kyle’s school gets evacuated and teachers try to get their students home. Kyle has to cross the bridge to get to Brooklyn, where his home is. He sees something strange at the bridge, which looks like a big bird. When he moves back and tries to take another look, he discovers that it is a girl, who is wearing huge wings. It appears that she might be trying to jump into the river. Kyle rushes and gets her and takes her home. She appears to have suffered temporary amnesia probably because of the shocking events of the day. She can’t even remember her name. We also learn that Kyle’s father and Uncle Paul are officers with the NYPD and are at Ground Zero, his other uncle Matt who used to be at the NYPD is paralyzed because of an accident and lives with them, while his mother and daughter are in LA for an audition. How does Kyle handle this situation? Who is this mysterious girl whom he feels responsible for but whom he also feels attracted to? Is Kyle able to reach his dad during this day filled with crisis? Is Kyle able to reach his mom? How does the story of each of them pan out? You should read the book to find out. I loved the way the story is told, the narrative voices alternating between Kyle’s and the girl’s. Kyle’s voice narrates the story and moves the action along, while occasionally contemplating on life and the deeper meaning of things. The girl’s voice is poetic, dreamy, surreal. Both of them complement each other so beautifully. I liked some of the little things in the book that we discover when we look carefully – like this nod to Dickens – “it occurs to me that, in the middle of one of the worst things that has ever happened to me, is now also one of the best things.” The ending of the story is bittersweet but perfect. There is a note by the author at the end of the book in which she describes how she was inspired to write the book. It was beautiful to read. I loved many passages from the book. Polisner’s prose is beautiful and I couldn’t stop highlighting passages. Here are two of my favourites. “Well, it feels like that, Kyle, back there. Like I’m adrift, in soaking wet clothes that are too heavy with the weight of things I don’t even know. And then the water doesn’t drown me but carries me and, for a second it lightens everything a little, and I feel momentarily hopeful. But always, there are things, beneath the waves, threatening to pull me under. And the land is right there, close enough to swim to—I can see it—but I’m not sure I want to come back to shore again. It’s like I’m here, solid, but I’m not connected to anything. I’m completely untethered. I know that makes no sense,” she says. Change comes in two ways. The first is the blindside way that comes without warning. Like Uncle Matt’s motorcycle accident. Or the Twin Towers collapsing one Tuesday morning as you’re minding your own business in school. Or a girl showing up out of nowhere, covered in ash, and wearing some costume wings. That kind of change takes your breath away. But other times, change comes gradually, in that sure, steady way you can sense coming a mile away. Or maybe a day away. Or, maybe, a few short hours. And, since you know it’s coming, you’re supposed to prepare. Brace yourself against the stinging blow. But just because you plant your feet wider, doesn’t mean the blow won’t take you down. Have you read ‘The Memory of Things‘? What do think about it?